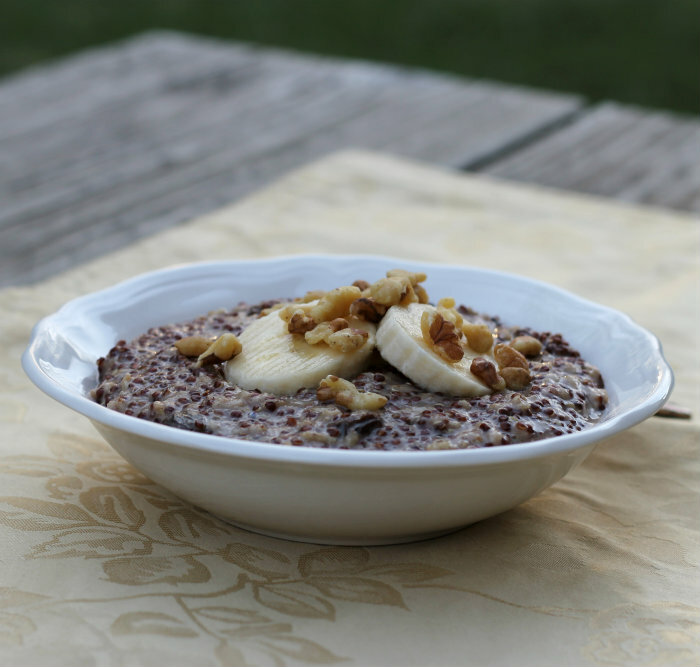 Quinoa oatmeal porridge… a healthy and satisfying breakfast. 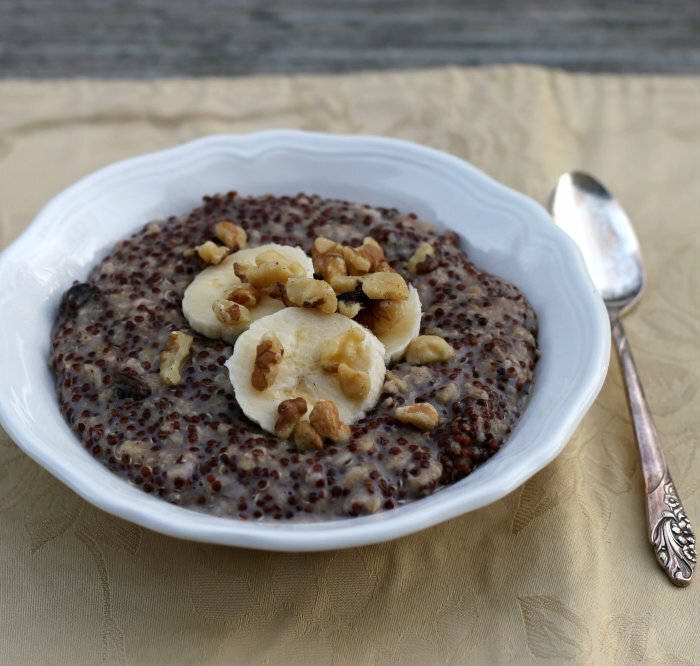 It has been a while since I have made any dishes with quinoa for breakfast. I guess it’s because I haven’t had any quinoa in the pantry of late. It has been rolling around in my head for sometime now, so when I went grocery shopping this past weekend it was on the top of my shopping list. When I was looking for the quinoa on the shelf at the grocery store I noticed that the red quinoa was much cheaper than the white or the black quinoa. That is why you are seeing the red quinoa in the pictures. I have read that there is really no real difference in the how the different colors of quinoa taste, so it was a no brainer. I do have to admit, I find the red quinoa more eye appealing than the white quinoa. When I was eating the porridge, I started thinking about Goldie Locks and The Three Bears. You may know the story where Goldie Locks comes in the house of The Three Bears and tastes the porridge of Papa and Mama Bear and finally eats all of Baby Bears porridge. If the porridge would have been this quinoa oatmeal porridge, she would have waited for Papa and Mama Bear’s porridge to cool and she would have eaten their porridge too. Yeah, that is how tasty this one is. Can you tell that I am a grandma to a 2 1/2 year old granddaughter, who loves fairy-tales? Seriously this is really a tasty breakfast treat. I spiced up the porridge with some cinnamon and cardamon. There is a bit of honey and raisins to give a hint of sweetness. Then I topped it off with a few slices of banana and walnuts, since I thought they would go nicely with the porridge. I used 2 % milk, because that is what was in the fridge, but I think almond milk would be fantastic with this. Oh, and I used old fashion oats, but I think steel cut oats would be better, even though I did enjoy the old fashion oats. 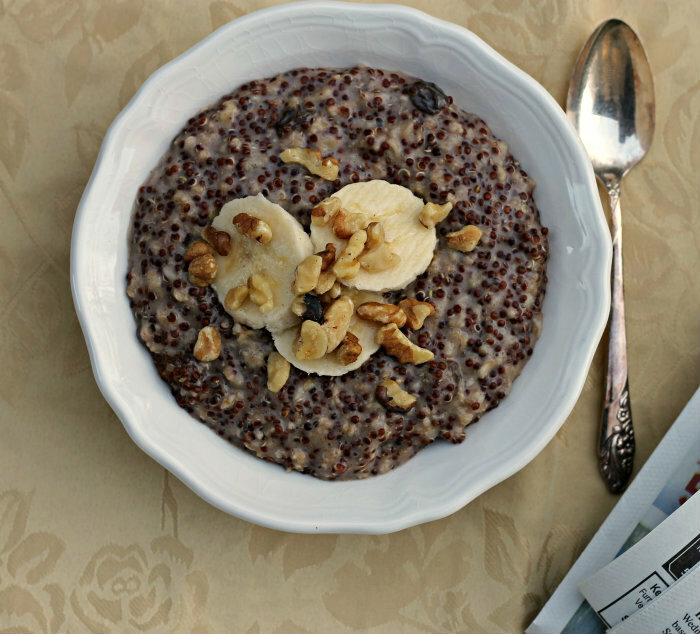 I hope you treat yourself to a bowl of this quinoa oatmeal porridge for a healthy and very satisfying breakfast. Rinse the quinoa and place in a small sauce pan with the oats and water. Bring to a boil; once it is boiling turn down to low and continue cooking until all the water is adsorbed. This should take about 15 minutes. When the water is adsorbed and the sauce pan is still on the burner add the honey, raisins, cinnamon, cardamom, salt, and milk, stir until all is combined. Once the ingredients pour into a couple of bowls for small servings or one bowl for a larger serving. Top with slices of bananas, walnuts, raisins, or whatever fruit or nuts you desire. I love the flavor of cinnamon, but if it is not your favorite spice you can add 1/4 teaspoon. I love porridge! This look awesome!! Yum! 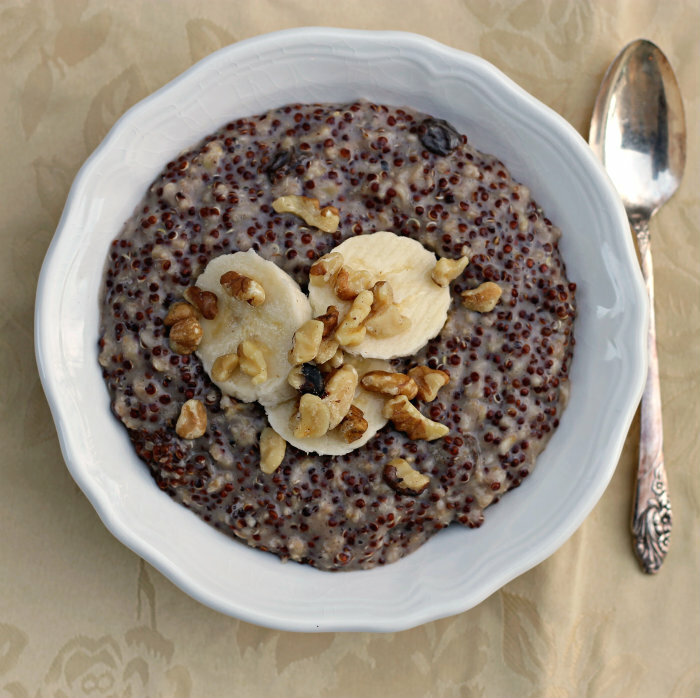 This looks like a delicious break from just boring oatmeal! 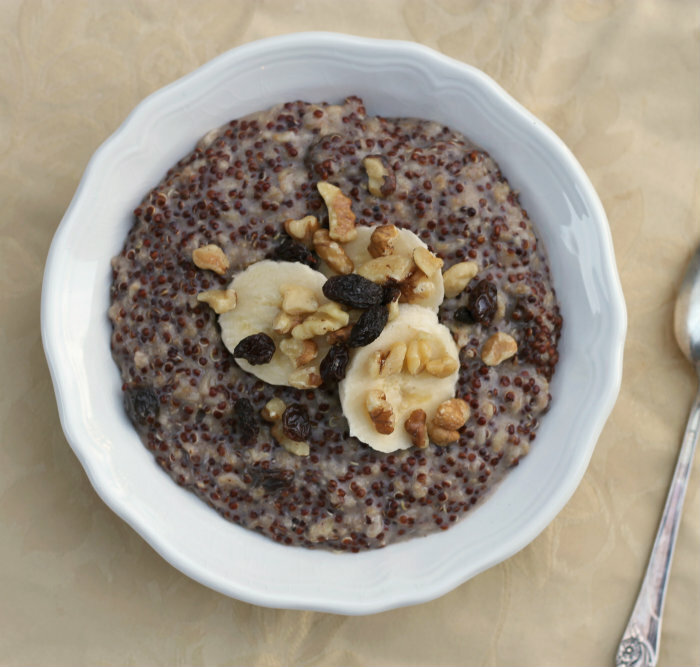 I love quinoa, but I’ve never eaten it for breakfast. I think I need to start now! What a nice, healthy breakfast alternative! I love the way you spiced it up! This looks like a delicious bowl of energy that would set one up for the rest of the day. This is my kind of breakfast…like the idea of cardamon…looks great and a wonderful way to start the day. I always have quinoa in my pantry and this is such a great idea to use it up! !